While most free-to-play games are garbage, regardless of the platform, sometimes one of them sneaks past your defences and actually finds its way into your spare time. Even I, as hostile as I am to the business practice in general, have my weaknesses. One at the moment is Star Wars: Commander, which is a terrible video game but damn it, it’s so cute. My main indulgence, though, was and always will be (at least in my heart) Battlefield: Heroes. EA announced that the game is shutting down today, and to be honest, it’s been a while since I thought about it. But when it first came out in 2009, I loved this game, more than the actual Battlefield games of the time. It was simple, it was fun, it was well-balanced, it had great maps, great vehicles, a fantastic sense of style and, most important of all, it really was free to play. At launch, the only things you ever felt you had to pay for were some weird and wonderful outfits for your Second World War-but-not-really soldiers (there were perks and items, but you never needed them to succeed or have fun). Whenever I wonder why the hell people spend money on League of Legends, which is another game that’s both fun and free, I remember Battlefield Heroes, and how I once spent $12 (actual human dollars) to make my main character look like Sean Connery from a Bridge Too Far. And he looked good. Of course, it wasn’t long before EA ruined all the fun. A big reason people stopped talking about the game was that it soon turned into a money pit, which might have padded its books for a while but also drove away a lot of early players who had just signed up for the cool art and sweet fighter handling. It’s easy to generalise and make fun of free-to-play games—a trap I often fall into myself—but it’s worth remembering at times like these that while most really are poisonous money extractors, some exist as games that are genuinely fun, and which encourage people to spend money instead of constantly demanding it. 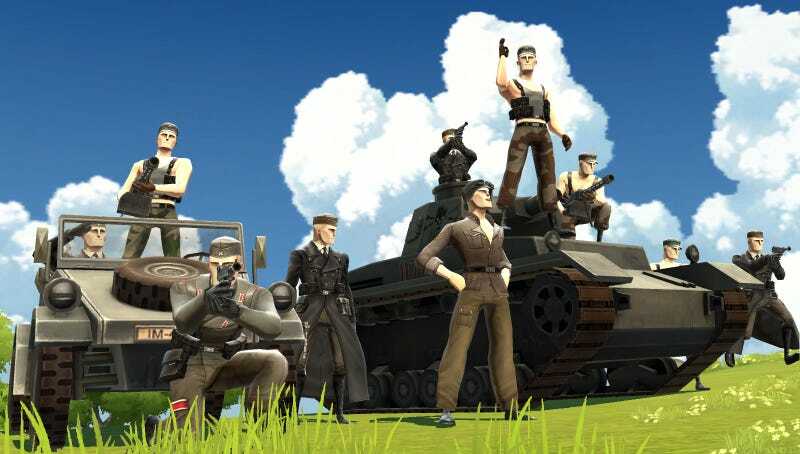 For a short time, Battlefield Heroes was one of those games. Something I’ll always be thankful for. And while the business model it initially tried to work with was quickly dumped, it’s at least nice to see it live on (and prosper) in bigger games like League of Legends, DOTA 2 and Team Fortress 2.